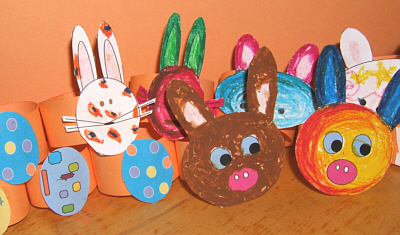 We not only like to celebrate Easter and other festivities, we love to do crafts and crafty stuff with children on these very special occasions. Be it friends of your own children, some kids from the neighbourhood or relatives and friends, soon a big bunch of young craftistas will be around your table. Serviette rings with sweet rabbit heads or Easter bunny heads or perfect for paschal mood. 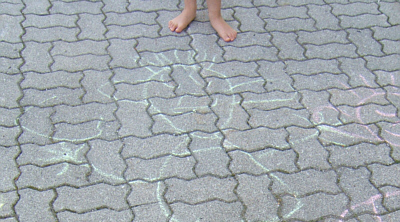 Colour the template. 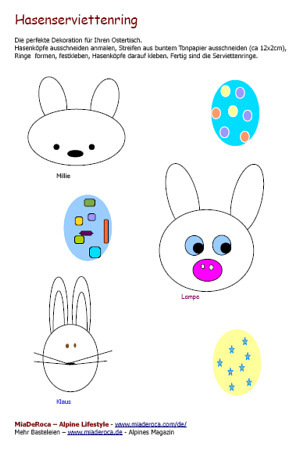 Its best to let kids draw what they like, be it striped, tabby or dotted Easter Bunnies. As Easter is a spring feast it can be very colourful. Cut out the coloured bunny heads. Cut out stripes of the thick paper, 12cm in length and 2cm in width usually works fine - it depends on the kind of serviettes or napkins you are using. Form rings out of the stripes and glue them. You might want to fix the rings with paper clips. When the glue is hardened glue the bunny heads on the rings, let dry. 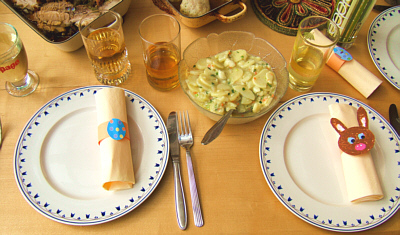 Ready is your very individual Easter table decoration! Those who like a dash of green on their Easter table, make some cress eggs you can even use them as name card holders. We from MiaDeRoca wish Happy Easter!